Senseo Features • The first single-serve coffee system that delivers a fresh, consistent cup of gourmet coffee in under a minute • Fast and easy to use • Brews high-quality, great-tasting premium coffee available in varieties to suit every taste • Customizable to ensure your get exactly the cup of coffee you want, every time • Revolutionizing at-home coffee by providing a gourmet cup of coffee at the touch of a button • Attractive solution for the coffee lover seeking convenience without sacrificing taste • Specially designed pre-measured pods, mean virtually no clean-up • Measures 13-1/2 by 12 by 8-1/2 inches • Includes two pod holders a shallow holder that holds one coffee pod for one cup, and a deeper filter that holds two pods for two cups (or one 8-ounce mug). • Up to five 4-ounce cups can be brewed on one reservoir of water • All removable parts are dishwasher-safe • 1-year limited warranty. 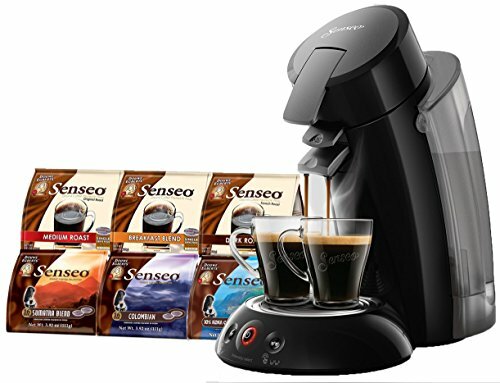 6 Bags of Senseo Coffee Pods included in this offer - Senseo 6 Flavor Variety Pack Sampler - 6 packs total of 102 Senseo coffee pods - includes the following 6 coffee bags: Senseo Dark Roast and Senseo Medium Roast 18 pods per bag Senseo Colombia, Kona and Senseo Sumatra 16 pods ber pag Senseo Breakfast 18 pods per bag 102 Senseo Coffee pods for 102 servings. Coffee may ship separate. If you have any questions about this product by Senseo, contact us by completing and submitting the form below. If you are looking for a specif part number, please include it with your message.